I've never been so thrilled so quickly with a new Doctor as I am with Matt Smith's Eleventh Doctor. When I first saw him in interviews shortly after he'd been cast I was thinking, "You have to be kidding me! He looks like a teenage refuge from an '80's punk band!" 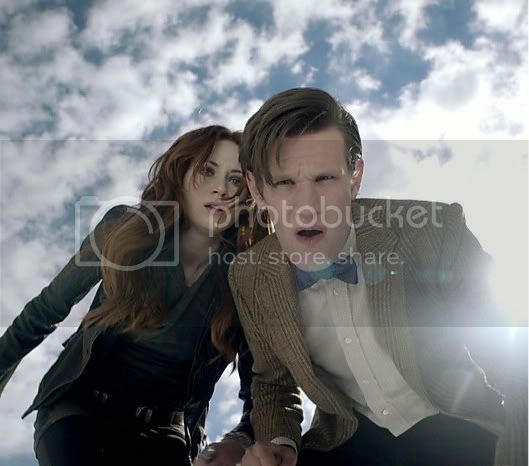 But by the end of "The Eleventh Hour" I was completely gob-smacked at how amazing he was. Series 5 is my favorite season ever; even the lamest episodes that would have been un-watchable with anyone else were fun to watch. I've watched this season over and over again, something I've never done with previous Who (except a few of Eccleston's episodes). Plus -- can I say this about someone 20 years younger than I am -- I think he's absolutely gorgeous? I think he's the best thing about series 5. That said I did harbour hopes for an older actor. I applaud him for working well with some IMO awful scripts and directing. I don't find him attractive, though I enjoy being able to watch the show without hot flushes now. I think he shines best alongside Arthur Darvill, who I think is excelllent. I think he is fantastic! And technically he was my first doctor and is what really drew me into the series. I love that he is so manic and alien and brilliant and a generally crazy. I think Matt Smith is great as the Doctor! To me he certainly lives up to the high expectations of Tennant! I remember when I saw the programme about casting the 11th Doctor, I was really happy that it was him, OK, I'd only seen him in the Ruby in the Smoke, and The Shadow in the North, but I had a hunch he was going to be great! ok, it did take me a couple of watches of the first couple of episdoes to get used to him, but now I have to say that he is deffo my favourite Doctor! I love his youth but also the way he's seen as "wise" almost and how he shows he's old. Yes, I have to agree that Eleven is Awesome! This was my biggest worry when Moffat said the second half of next season would be Series 7. I'm not thrilled with the split, but I can live with it just so long as it doesn't put my favorite Doctor a series closer to leaving. A recent article here ( http://www.digitalspy.com/cult/s7/doctor-who/news/a267294/matt-smith-to-stay-on-who-until-2013.html ) said he'd be staying through 2013, the show's 50th anniversary. I hope that hasn't changed. It's not like the three series rule is actually a rule. I'm hoping he does a Tom Baker and sticks around a while. I remember being very disappointed when I heard he'd been cast as the Doctor, but as soon as I saw The Eleventh Hour I realised how wrong I'd been. He's already definitely my favourite Doctor since the series came back. I just love the 'alienyness' he brings to the part - it's obvious from watching him that he's a 900-year-old alien, the very idea of him being a 20-something actor from Northampton seems absurdly far-fetched. I never really got this feeling with his two predecessors; great as they were, they always seemed a little too human for my tastes. Great actor, great Doctor (agreed he does the 900 year old alien that 9 and 10 didn't quite nail) and I hope he sticks round for the 50th anniversary year. And, I disagree what others have said about the scripts. I think the scripts have been on a par of anything in seasons 1 to 4. I just saw The Eleventh Hour first the first time, and I definitely think he is going to be the best thing about Season 5. I had reservations (10 is very much my doctor, followed by 9) but I love the fact that they all bring something different to the role - 9 had gravitas and angst, 10 had a childlike innocence and fascination in everything and 11 seems so 'alien-y' as someone said, he's awkward and you really believe he's an old soul. I'm not so sure about Amy though. I actually preferred her as a little girl to tell you the truth, I loved those scenes and there's something potent about the idea of having a Doctor has someone's faux imaginary friend. I wish it could have been explored more. That perfectly sums up my position as well. When the confidential came on announcing MS as the Dr I wasn't quite hurling things at the screen but when people were asking me how I felt about it It was like I was responding to being given a present I didn't really want. Then the 11th Hour hit me and I loved it and him. His performance in the season finale was truly breathtaking and actually in amongst all of the mixed feelings and ambivalence about other aspects of season 5, I find it is MS's portrayal of the Doctor which is the constant beacon throughout. A dollop of Troughton, a twist of Davison, a hint of Hartnell and some of his own unique style as well. He is definitely a Doctor to savour and I think we haven't even seen half of his true potential yet. Totally agree with you! In some cases far superior, especially to season 2. Drivel is in the eye of the beholder. I hated the Human Nature episodes. Empty Child was OK. Heart jumping for me - Time of the Angels/Flesh and Stone, Amy's Choice, Hungry Earth/Cold Blood, Pandorica Opens/Big Bang. Especially the Big Bang - I don't think I even moved for the entire episode. I think the entire season 2 is drivel, but there are people who rate it highly. We have had a complaint from the neighbours! I know nothing negative was said about Eleven in here, but can we try to keep overall negativity to a minimum as well as I have had a PM from someone who isnt happy. Back on topic then - I love this bit of TPO. I give it full marks for showing just how awesome Eleven is.